With the cutely named Windows Me (for Millennium Edition), Microsoft raises the bar a bit with a new operating system that you'll certainly want to consider for your next new PC. While this version will probably not be a compelling upgrade for most Windows 95/98 users, the newest member of the Windows operating-system family bundles a number of minor improvements aimed at making computing life easier for home users. 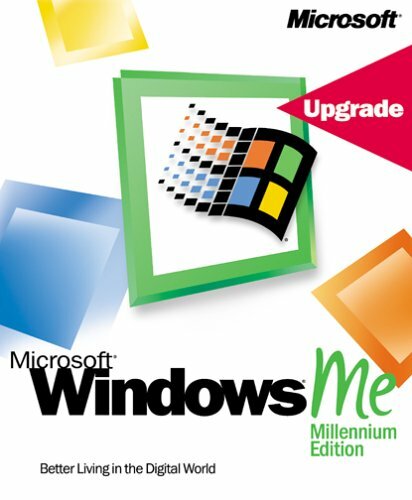 This upgrade version of Windows Me is available for licensed users of Microsoft Windows 95, 98, or 98 Second Edition only. There are several noteworthy features in Windows Me, even if no one feature really stands out. First, we liked that Windows Me boots noticeably faster. The reason is that the underpinnings of DOS have been removed from this new release. One result of this absence is that you can no longer boot to a command window as in Windows 95/98 without special diskettes. (Also, don't expect Windows Me to support older hardware that uses virtual device drivers written in the days of yore.) Of course, you can still run DOS command sessions within Windows Me. Besides removing legacy support for DOS, Windows Me adds several other improvements to reliability. The most important is that every 10 hours or so, the operating system automatically backs up its system files (just like Windows 2000), thus reducing the chance of your system being corrupted. Windows Me also borrows the TCP/IP stack (the low-level code that connects to the Internet) from Windows 2000, meaning you should have slightly more reliable networking connections. For laptop users, you can also hibernate a session and restore it quickly, another feature borrowed from Windows 2000. The personality of Windows Me also changed a bit for the better. Principally, you can take advantage of personalized menus, which show the most frequently accessed menu choices on the Start bar and hide the others. (This feature is also based on Windows 2000, but don't worry, you can turn it off.) Internet Explorer 5.5 is bundled here; so is support for working with compressed Zip files, which no longer require an add-on. Microsoft has been touting the multimedia capabilities of the new Windows Me. There's a built-in video editor for video files, and the operating system makes it easy to connect to today's video cameras, scanners, and digital cameras. But without built-in support for Real Media files, these features probably won't please everybody. Microsoft Windows Millennium Edition is a home operating system featuring digital media, an improved user experience, enhanced home networking, and a rich Internet experience. Windows computing offers extras like the Windows Media Player 7 and Windows Movie Maker, and it supports the latest in gaming technologies like DirectX, graphics accelerators, in-game chat, and more. Using Windows is now even safer with new features like System Restore, to quickly restore your computer to a previous working state, and System File Protection, providing built-in safeguards to prevent accidental deletion or overwriting of key system files. This operating system even updates itself by automatically downloading the latest enhancements from the Web. The included Microsoft Internet Explorer 5.5 and Outlook Express afford a rich and full Internet experience. Take advantage of simple desktop-based tools to import photos from scanners and cameras, then organize, print and share them. Newly enhanced support of home networking includes step-by-step directions for setting up shared Internet connections, printers, and other peripherals, with full support for Ethernet, Home PNA, and wireless networks. Need help? Microsoft Windows Millennium Edition now offers a centralized location to find comprehensive and easy-to-use help--the Windows Help Center. Note: This upgrade requires a licensed copy of Microsoft Windows 95, 98, or 98 Second Edition. Installed it as an upgrade to Windows 98SE, now I have multiple crashes and can't stay on the internet for more than 2 minutes without a reboot unless I use Netscape as the browser. Inlcuded video camera software is suspect at best and tells me my system is too slow ... yeah right. We are at a point where 10g+ hardrives, 128m+ memory, really sophisticated drivers, Shockware, DirectX files and the like have become a way of life. So, having to rebuild your system from scratch from time to time (some folks luck out and never have to do this, I do) can take 10 - 12 hours. With what appears to be an exponential increase in the amount of files, drivers, applications, OS that have to work together harmoniously, upgrades (as opposed to the full product) are becoming a not so good idea. Reason: The sucker either works correctly or not, period. No ones fault, this was in the stars eventually. Can't keep adding and adding and adding stuff to your hard drive and remain a happy camper. It is, in my opinion unfair (unrealistic, actually) to single out the ME upgrade, which will work correctly or not.Not in my case. When launching my Encarta DVD Suite 2001 which worked fine before upgrading from 98 to ME. I received an error message that my Macromedia Shockwave file was not present. I did a search, and it was still there. ME just didn't see it! What the heck is that all about. Stay with 98, until they put out something stable! Windows ME is a 'fluffy' version of Windows 98, only it features a massive memory leak - meaning you NEED one of those RAM Boosting programs (aka memory managers) just to keep more then 2 applications going at a time. I ran Windows ME for about 3 months before becoming completely frustrated with it and moved to Windows 2000 Professional. This product appears to have been an attempt to create what Windows XP is today, only it failed misserably. This is NOT the operating system for power users or professionals, not that I would recomend it to anyone to begin with. I just installed this yesterday and have already uninstalled it becasue it causes major computer problems, including tons of crashes on a three-month old 933 Mhz P3 with 256 MB RAM and plenty of HD space that NEVER crashes with Win 98. Now that I unistalled it, Win 98 is working fine again and relatively error-free. Most of what comes with it is available without the upgrade. I can't understand why so many people seem to have so many problems with ME. I got my computer with factory-installed Windows ME just under two years ago, and ME has performed virtually flawlessly for me in all that time. Yeah, it freezes from time to time, but not very often, and a reboot usually unfreezes things nicely. Installing peripherals with ME is a snap with the installation wizards; setting up an Internet connection was a breeze with the ISP's installation disk, and I'm NO computer geek! Straight from the Redmond trash file! As the hard drives go from kilobytes to megabytes to gigabytes & shortly terrabytes, and as we install more and more memory, 128m + (I remember when only Main Frames had 128m!) we are going to continue to put more and more and more stuff on our disks. How will these dozens/hundreds of applications, countless thousands of application/system files, and many many drivers all work together harmoniously? They won't. Why? because they can't. Too much stuff! The solution that worked for me; I reformatted my disk (forget uninstall programs, they miss stuff, wipe that sucker clean) and I installed the 25% that I really needed and forgot about the other 75% that I just wanted. The wanting, and all of that enticing free space on my disk is what caused the problems. If you say, ah, the heck with that! I want lots of stuff! Fine. O.K. fine, it's our God given right as americans to complicate our lives and take as many tranquilizers as we want. But in this case, I believe it may be to one's advantage to think of the full OS, rather than an upgrade. Upgrades and lots and lots of stuff cannot co-exist. On the other hand, lots and lots of stuff and buying the full operating system will probably cut your tranquilizers in half. If you stop and think about it, in this "I want a car that I can drive 75 mph and get 80 miles a gallon" society, that 50% savings on over the counter drugs isn't such a bad deal. Windows ME is not capable of ever being compared to Windows 2000, not even Windows 98. It is a good upgrade for those of you running Windows 3.0, but if you have Windows for Workgroups v3.11 or above, with the exception of 98 second edition - stick with it... ME is 98 with some bugs taken out, more added into it. There is very sketchy industry support for this release of windows. Don't assume that if the software is recommended for 95/98/NT that it will run on ME. It probably won't. I have a brand spanking new P4 with which I can do next to nothing without seeing kernel32.dll errors. ME gracefully handles these by freezing. I had to unplug my computer in order to reboot. Looking on tech support sites (not MS's of course) it is clear that I'm not the only one having problems. All I can say is, the computer I had with Windows 95 on it is still running strong at my parents house, whilst this one I bought new with Windows ME on it constantly hangs up and crashes. I know some people have reported problems with this version of Windows but I've been quite happy with it. I've had no major problems since I installed the upgrade. I was using Windows 95 and it just lacked some of the features that I needed. I use mostly older MicroSoft programs. Word 97, Access 97, Publisher 97 and Lotus Organizer so my programs are old by today's standards. I needed the camera and scanner capabilities of Windows ME and they are working fine for me. I was also using Netscape 4.5 as my browser and email reader. As this version of Netscape was quite old I was pleased to get a newer version of Internet Explorer and Outlook Express supplied with the Windows ME upgrade. I loaded this upgrade on a six year old Toshiba Satellite Laptop Computer - Model 315CDS. It was running a factory installed version of Windows 95 when I did this upgrade. Windows ME recognized all of my hardware and all my files and programs seem to be fine. I don't play games or do any video or music stuff on my computer so these may be the problem areas others have reported. I can't comment as to whether Win Me is suitable for those of you who do. I use my computer for mostly word processing, desktop publishing, text, picture and photo editing. Some of the new file features and picture preview thumbnail features are extremely useful for me. I had no trouble at all with the installation. I took me a little longer than I anticipated. The loading screen claimed it would load in 30-60 minutes. I believe it was more like an hour and a half but at least it loaded with no problems. All I basicaly had to do was put the CD in the drive and hit enter a few times. It was a very painless installation. WINDOWS Me operates great, even on 200MHz systems. But, You're going to have problems if you install it as an upgrade on top of your existing Microsoft operating system. I build/repair/upgrade computers as a hobby. My household also has 3 computers using "Me" & there are no problems...EVER. The TRICK is...(1)Backup your existing personal stuff & wipe clean your hard drive, make sure you have other driver/program disks, you can get updated drivers on their respective websites. (2)Format & Partiton your hard drive. (3)Run WINDOWS Me SETUP, it will ask you for another version to continue - Put it in CD-Rom, it is only going to read it to verify you have a licensed copy. (4)When prompted, put "Me" disk back in & continue with setup. It will even install some audio & video drivers for you. I installed ME several weeks ago and just wanted to comment on one weird thing I noticed. For some reason, my little Netsonic "web accelerator" program from Netboost, Inc. has stopped working. This program caches web pages and does other things to speed up access and load web pages faster when I'm online. Since, probably due to the quality of the local phone lines, I usually don't get anything faster than 31,200 baud, and most of the time is more like 28,800, this was very useful for me. However, Netboost's Netsonic appears not to work with Windows ME after having worked just fine with Windows 98 for over a year. I tried reinstalling it from the original downloaded zip file but no luck. The other suspicious thing is that after I completed the Windows ME install, I would get a status message from the Netsonic program that my system would have to be rebooted for it to work. However, rebooting didn't help and I now get this message every time I boot up. I tried re-installing the program from scratch but this didn't help, I still get the same message. Netsonic still doesn't seem to be working. I find this hard to believe because I doubt this program has anything special that would depend exclusively on Windows 98, and also I can't see that I'm doing anything wrong either in terms of the configuration (there's nothing to configure anyway). As I am a professional NT support person, I usually know what I'm doing with these things (but not always!). Anyway, overall Windows ME has been okay for me, despite being somewhat more unstable. The main thing is that it boots up and shuts down a whole lot faster, and since I turn on my system several times during the day this is useful. I would say it boots up 4 times faster and shuts down 8 times faster, so the difference is considerable. This is due to the remnants of DOS finally being eliminated. So far I would have to say ME for me is liveable. I've read most of the other reviews here and it looks like most people are advised to beware of this upgrade. As I work in the support business I see all the horror stories caused by these sorts of upgrades, so I myself am surprised when these things go relatively smoothly as they did with my system, because I'm basically always prepared for the worst. Fortunately, this one wasn't one of them. Overall, however, I would have to say that the average user should think twice about performing this upgrade, and be prepared to back out if there are too many things that don't work anymore or the system seems markedly more unstable. I have a very plain, vanilla system with not much on it from a major brand name (HP Pavilion) that is only a year old, and as I've mentioned here, even I'm encoutering a few bugs. Great price for a clean installation for my laptop!!! This is not so much a Review of Windows ME, which I do run and works fine, but a reminder for those concerned consumers who may happen to get caught in the flame war of whether or not Bill Gates rips people off. Windows ME is as good an OS as a regular user can get that is both familiar to them and easy to use. As for those comments that it "isn't any different" from Windows 98, as far as the User Interface is concerned you're absolutly right, there is no difference in how the OS looks, feels, and is used. That's Microsoft's goal, to have a common user interface. All of the major OS differences are IN the OS. Built in drivers, bug fixes, the ability to use more up to date technology, expanded memory capability, security fixes and the like. All things the user can't see. I was running Windows 95 on my desktop, which is an AMD-K6-2 (350 mHz) with 64 MB RAM. My laptop, which I purchased used, is a Compaq Armada 1590DMT (150 mHz) with 80 MB RAM, which came with Windows 98. I have a 24 gig C drive on the desktop, and only 2 gigs on the laptop. I upgraded both machines to Windows ME with no problem at the same time. For some reason, unknown to me, when you go through "Start" and "Shut down" on the desktop, it never shows the "It's now safe to turn off your computer" notice--just a horizontal stripe on a dark screen, but I can tell by the sound that it's finished the cycle. I'm not troubled by the problem. The laptop does fine. The one feature which I have learned to like in ME is the "Restore" function. When you do have a system problem, it is relatively easy to restore the machine's system to a previous time, when everything worked. In fact, when the machine starts in "Safe" mode, it automatically takes you to the "Restore" function, which you can either accept or reject. No recently loaded applications or files are lost with restore. Only the system is restored to an earlier time. Other than that, there are no significant visual or operating differences between 98 and ME that I can see, and I've run it for three or four months now. There is one difference in capability, which cost me some money. I had a French made flatbed SCSI scanner which I liked, and it worked fine with Windows 95. However, Windows ME does not support SCSI, and so I had to purchase a new Hewlett-Packard scanner which plugs into my parallel port. (The printer plugs into the scanner.) Currently I'm having trouble with the scanner operation, but the printer works fine. I'm going to have to sort that out when I get time. However, the HP scanner DID work with ME, and I assume I can make it work again. That's about all the comment I have on ME. No more complaint than one usually finds with a Microsoft product, and I'm used to the little glitches. Sometimes I wish I could just go back to DOS, when things were simpler, before Microsoft tried to make things "user friendly" and reduced our control in the process. Joseph H. Pierre, author of "The Road to Damascus: Our Journey Through Eternity"
Do a "clean" install FOR SURE! Two weeks ago, I carefully installed Windows ME on my computer, replacing the preinstalled Windows 98. That was a mistake. While ME has some nice features and improvements over 98, it left my system more unstable and buggy than it had ever been before. For the record, my computer easily met the system requirements for ME. Anyway, after the upgrade, I found IE 5.5 to be slower than IE 5.01, Media Player 7 was a piece of garbage, my McAfee VirusScan loaded much slower, there were video driver glitches, etc...I had similar hassles years ago when I upgraded another computer from Windows 95 to 98. After the experiences I have had, I do NOT believe in upgrading your PC's operating system. If your machine came preinstalled with Windows 95, 98, or ME, then leave it alone. Putting in a new OS totally upsets the equation and causes innumerable problems. Many of these problems don't develop right away. Also, upgrading your OS often violates your manufacturers warranty. So if you need tech help, often the maker of your PC will say..."sorry, but we can offer no support since you changed the operating system. Call Microsoft". So a few days ago, I got fed up with the glitches and completely erased my hard drive, and put back in Windows 98. My computer works better than ever. 1 Star Only because -10 Stars is not an option!